February 11th-Iwabuchi Vs Rivera and Zhong Vs Bin! The main action of the day sees action return to the Korakuen Hall for what looks to be a genuinely interesting looking card. The main event will be a real treat for fight fans as punchers collide in a bout for the OPBF 140lb title. The match up will see former Japanese champion Shinya Iwabuchi (26-5, 22), fighting in his third OPBF title fight, face off against Filipino puncher Al Rivera (14-2, 12), who comes into the bout on the back of a stoppage win over Adones Cabalquinto last November. This will almost certainly be a fire fight and, given the power and style of the two men involved we wouldn't be surprised if this ended with an eye catching KO. As well as the mouth watering main event this card features 3 other bouts of note. One of those is an evenly matched Flyweight bout between Yuta Matsuo (9-2-1, 5) and Seiya Fujikita (8-2, 1). This is a wonderfully matched bout between two fighters with similar looking records. Matsuo has won his last two bouts but was beaten last May by Ardin Diale whilst Fujikita has been very close in both of his losses. This really could be a very competitive and exciting bout. A less competitive, yet still very relevant match up, will see the unbeaten Daishi Nagata (5-0-1, 3) battle against Kentaro Endo (5-6, 4). It's hard to see anything but a win for the unbeaten 26 year old here, however Endo is no push over and could test Nagata. Possibly the most eye raising bout on the card will see the much touted Shuichiro Yoshino (1-0) battle against Thai veteran Chaiyong Sithsaithong (39-14-4, 28) in what will almost certainly see Yoshino answering questions about his potential. This really is a risky match up for the unbeaten 24 year old. As well as the action in Japan there is also set to be a very interesting card in Chin where two codes of professional boxing collide in what is being regarded as a very unique show to begin the Chinese new year. The main event of the card will see former WBC Minimumweight champion Xiong Zhao Zhong (26-6-1, 14) face off with APB champion Lu Bin. The bout between the two has been hyped by Chinese boxing sources as a “Super Bowl” of boxing and is a real oddity in boxing where the “normal” professional fighters and the “APB” professionals have stayed away from each other. Unfortunately a lack of clear details on this bout do leave us wondering if the contest will be counted officially on either man's record. The show will feature three other, similar bouts, one of which will be between the under-rated Xinghua Wang (12-13-1) and Jiawei Zhang. September 5th-Japanese interim title fight headlines Dangan138! Although the new month has had a slow start it does appear that things are going to get going on the month's first Saturday, and what a day it looks to be with a genuinely mouth watering domestic Japanese card. The Japanese card comes from the Korakuen Hall and features a bit of everything. The main event is a Japanese Light Welterweight interim title fight between the once beaten Masanobu Nakazawa (17-1-1, 7) and former challenger Masayoshi Kotake (9-9-2, 5). Originally Kotake was supposed to fight reigning champion Hiroki Okada though a serious injury to Okada's right thumb saw him need to cancel the bout which has lead to this fight. On paper it's hard to see anything but a win for Nakazawa though the truth is that his record is very padded and this is a huge step up against the much more proven, though limited, Kotake. A really mouth watering match up will see former Japanese Light Welterweight champion Shinya Iwabuchi (25-5, 21) battle against former OPBF champion Romeo Jakosalem (16-10-1, 8). Iwabuchi is rarely in a bad fight and the heavy handed southpaw is known to want another OPBF title fight, having fallen short twice in the past. Jakosalem isn't the fighter he once was, but is still a dangerous foe if given full preparation time, which he has been here, and as a result we're expecting a very special war here. Another former champion in action is the always entertaining Rikiya Fukuhara (30-8-1, 22) who will look for win #31 as he takes on Yusuke Nakagawa (8-3-1, 4). Although not the best fighter on the planet Fukuhara is a real handful for many and he's only been beaten by one man in the last 4 years, the world ranked Satoshi Hosono. It's hard to see Nakagawa giving Fukuhara too many problems here though we'd be shocked if the bout wasn't entertaining all the same. One man who will be hoping to move from contender to champion in the near future is Ryuta Otsuka (14-8-2, 4) who will be risking his JBC ranking against Takaaki Ishikawa (11-6, 6). Otsuka is ranked at Super Flyweight though will be testing the waters at Bantamweight here. Ishikawa, who has lost 2 of his last 3, may see this as a huge opportunity to get himself a domestic ranking and as a result we'd not be shocked for this one to be very exciting. Another really meaningful bout will see Japanese ranked fighters facing off against each other as Hiroya Yamamoto (8-3, 3) takes on Takumi Suda (12-10-2, 3). Both of these men are seen as possible title challengers for the Japanese title in the near future and we'd not be shocked at this bout being incredibly competitive. We've got to admit neither guy has been incredible in recent times though both have mixed with good company. Yamamoto's last two losses have come to Xiong Zhao Zhong and Go Odaira whilst Suda has suffered losses to the likes of Akira Yaegashi, Warlito Parrenas and Shin Ono and both are better than their records indicate. A second Japanese show comes form Osaka and really pales in significance to the Tokyo card. The most interesting of two notable bouts will see Akira Shono (8-7-2, 4) face a Thai foe in an 8 round bout. We've not got the name of the Thai though we do know that Shono is ranked by both the OPBF and the JBC, so those rankings could be at risk. As well as the two bouts we've mentioned there will be 7 other bouts on this card. In South Korea the KBC put on their next rookie card. On the whole this show is less than inspiring and features mainly 4 rounders. The one bout which isn't for just 4 rounds will see unbeaten teenager Gun Woo Gang (1-0-1, 1) face the more experienced Dong Suk Han (1-6) in a bout scheduled for 6 rounds at Welterweight. Staying with Korean fighter's we actually get a Korean novice in action in the US as Tae Woong Jung (3-2-2, 3) battles against the unbeaten Antonio Nieves (12-0-1, 6) in an 8 rounder. This is a considerable step up for Jung, who hasn't fought out of Korea before. Sadly for Jung he is 0-2-2 in his last 4 and won't be expected to end that win-less run here. If there's been a date marked down in every boxing fan's calendar this year it's been May 2nd. Whilst we may not have had “The Fight” signed until several months into the year it always seemed like a date set to have a big fight. Thankfully for everyone in boxing it's “The Fight” and not just “A fight”. Of course the bout in question needs no real introduction just 2-words “Mayweather” and “Pacquiao”. That's right, they finally get on and at a long last we get to see the mega-popular Filipino Manny Pacquiao (57-5-2, 38) battle against unbeaten American Floyd Mayweather Jr (47-0, 26) in a bout that many are regarding as the “Fight of the Century”. The contest will be the richest fight in history, it will see the WBA/WBC and WBO Welterweight titles all being unified and it will almost certainly see the sporting world come to a halt. There is nothing that needs saying about this one other than “it's really happening”. We'll admit it should have happened years ago, but better late than never, right? Prior to the big one fans in Tokyo get some interesting,action of heir own at the Korakuen Hall. The first of the interesting bouts here will see the fast rising Japanese based Filipino Johnreil Maligro (12-0, 9) battle against Ribo Takahata (10-5-1, 2). On paper this looks like a mismatch but Takahata has mixed with some solid opposition, such as Rikki Naito and Shingo Eto , and he certainly has the ability to test good prospects. Whilst Takahata could be a good test we have to say we were very impressed with Maligro last year who scored a trio of good wins, including an 88 second blow out win over Kazuma Sanpei. The chief support bout will see Hayato Kimura (22-7, 15) face off against Filipino slugger Jomar Fajardo (14-6-2, 7). Originally Kimura was set to fight Takuya Kogawa though it appears that Kogawa has pulled out ahead of a proposed Japanese Flyweight title fight. Despite the change of opponent this should still be a really good bout with Fajardo proving his ability with his two bouts against Francisco Rodriguez Jr, the first of which saw him scoring a draw with the talented Mexican. This could well end in an upset. In the main event fans will see the exciting Shinya Iwabuchi (24-5, 20) take on the well matched Ryusei Yoshida (26-6, 13) in a potential war. We like Iwabuchi a lot, despite his faults, and we expect him to be able to draw Yoshida into his fight, if he manages that then this will almost certainly catch fire and become a very fun bout for the fans in attendance. We do however need to admit that Iwabuchi didn't look great last time out. For the second day running Japanese fans get the chance to see action at the Korakuen Hall including the retirement ceremony of a domestic legend as well as the return to the ring of a very exciting 140lb fighter who found himself coming up short last time out. The fighter who is taking part in his retirement ceremony is former 5-weight Japanese champion Tadashi Yuba (46-10-2, 33) who won national titles from Lightweight to Middleweight in a sensational career that included wars, knockouts, heartbreak and a lot of fun. Sadly however Yuba lost 2 of his last 3 bouts, both in the last 12 months, and at 38 years old he is heading off into retirement. One man who will be continuing despite a loss last time out is Shinya Iwabuchi (23-5, 19), who was stopped by Keita Obara in an OPBF title fight. Iwabuchi, who was previously ranked in the top 15 by the WBO, is always exciting to watch he'll be hoping to get back to winning ways when he takes on Venezuelan journeyman Luis Araguayan (11-7, 6). We believe Araguayan was the third choice opponent for Iwabuchi and this shouldn't be a tough test for the exciting Japanese fighter, who we are huge fans of. Iwabuchi's fight is the main event bout and is one of just two bouts scheduled for 8 rounds. The other 8 rounder will see promising southpaw Kenta Nakagawa (8-2, 6) battle against light hitting veteran Takashi Nishimura (8-12-1, 1). Nakagawa comes into this bout on a run of 6 straight wins and will be expecting to extend that run against Nishimura who has won just 1 of his last 6 bouts. The rest of the card is relatively weak though there is a well matched female bout between the unbeaten Aiko Yamagishi (4-0-1, 2) and the once beaten Yunoka Furukawa (4-1-2, 2). Whilst we won't pretend this is a mouth watering match up it does look very even on paper and could turn out to be a fantastic and competitive contest. The card features a pair of Lightweight bouts each scheduled for 5 rounds in what appear to be B class tournament bouts. One of those will see Tsubasa Matsuo (8-3, 4) take on Manato Honma (7-3, 4) whilst the other will see the heavy handed Ryosuke Takami (5-1, 4) battle against Shintaro Nakamura (5-3-1, 2). Of the 4 men involved here Takami looks like the one with the most upside though he was stopped in the 2013 Rookie of the year final by Ryuji Ikeda in what was his most notable bout to date. August 11th-Dangan Double Header Promises Excitement! Every so often a special card comes along that fight fans really are unfairly denied the chance to see. This coming Monday has one such as card Japanese fans get one of the best double headers of the year and amazingly there isn't a world title in sight, a strange occurrence now a days with more world titles than there are top contenders. The headline bout is the more exciting of the two and is, potentially, the fight of the year. That's because we have the monster punching Keita Obara (11-1, 10) defending his OPBF Light Welterweight title against the aggressive and heavy handed Shinya Iwabuchi (23-4, 19). Between them the men have 29 KO's from 39 fights and if you've never seen them in action you've been missing out big time. Obara is the bigger puncher and has devastatingly heavy hands, as shown in wins over the likes of Kengo Nagashima, and it's very possible that he's the hardest puncher, pound-for-pound, in Japan right now. Whilst Obara is a brutal puncher Iwabuchi combines heavy hands with speed, combinations and a real killer instinct, as seen clearly in his win over Shamgar Koichi. Not only is Iwabuchi an aggressively fun to watch fighter but he's also tough as old boost, as shown in his war with Min Wook Kim. We can't emphasise this enough but this fight will be something very special. Whilst the main event on the card has "FOTY written all over it the chief support bout isn't too bad either as Japanese Super Flyweight champion Yohei Tobe (8-1-1, 5) looks for the first defence of his title. Tobe, who holds a stoppage win over former world champion Wandee Singwancha and an 8 round decision over Kohei Kono, will be battling against the unbeaten Sho Ishida (16-0, 9). This bout isn't quite as good as the other one in terms of styles but with both men coming to the contest with world rankings it's possibly more important in the grand scheme of things. Although it is a big step up for Ishida he does have criminally under-rated power and shot selection, including some lovely body shots as shown in his fight with Petchbarngborn Kokietgym last year. With two amazing bouts on the show it probably goes without saying that it's not a long one and the under-card features just 4 bouts. Surprisingly 2 of them are very solid under-card bouts. The first will see Yuki Ozawa (10-3, 2) attempting to end a 3 fight losing streak as he takes on Ryo Takenaka (10-2-1, 5). On paper the men are very matched and although Ozawa is on a bad run he has faced some good fighters such as Masaaki Serie and Koji Aoki, the big question for him however is how he will cope with a bout being fought at 131lbs and we think the weight will be the difference and will certainly favour Takenaka. The second of the interesting under-card contests will see the heavy handed Taiki Minamoto (9-3, 8) put his Japanese Bantamweight ranking on the line against the tough and experienced Yukinori Hisanaga (15-5-2, 9). Hisanaga has been inactive for a year though did give Japanese Super Bantamweight champion Hidenori Otake a very tough fight last time out. Minamoto is starting to develop into a very good fighter but this is a major test for him and a win if not a given at all despite his edge in power. February 28th-February ends on a high! February, despite it's occasional highlight, feels like it's been a very long and very slow month in terms of boxing. Thankfully it comes to an end this Friday in a crescendo of action around Asia, perfectly bringing in a new month which looks like it has more action than both February and January combined. The first of the action will be in Thailand on Thai channel 7. Unfortunately we've got to confess we've very unsure who this will be, though an educated guess suggests it could be Morakot CP. Freshmart (3-0, 2) defending his WBC Youth Flyweight title for the third time. Whilst we're uncertain on who is featured on the Thai show we are pretty confident on the action in Japan which has 2 separate shows. The more interesting of the two takes place at the Korakuen Hall in Tokyo. This show, "Dangan 94", features an outstanding bout made at 141lbs. 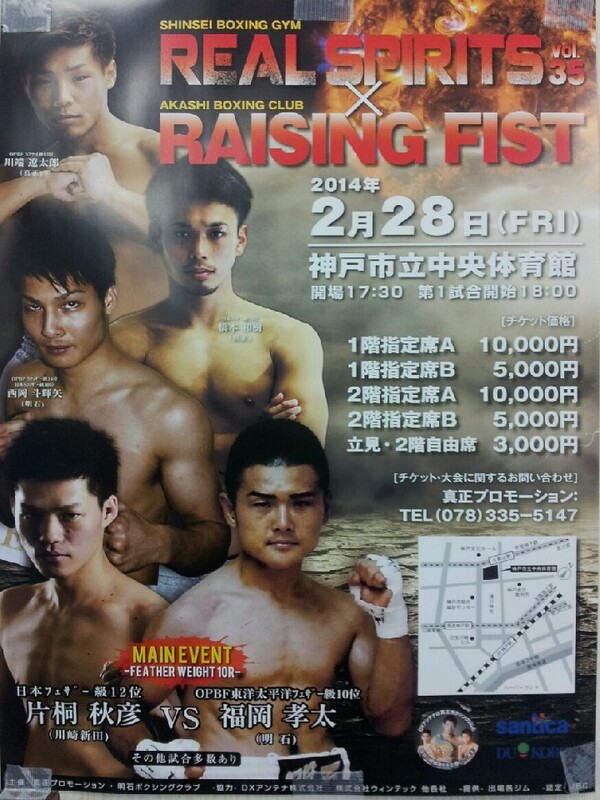 This contest, the highlight of the show, will see the big punching Shinya Iwabuchi (22-4. 18) taking on Filipino veteran Jimrex Jaca (39-6-3, 22) in what could well launch the winner into an OPBF title bout. Both are highly ranked by the OPBF and with the title being fought for in the coming weeks this really is an important match up. The undercard features several other ranked fighters including Tsuyoshi Tojo (12-12-3, 2) who defends his Japanese ranking against and Koji Umetsu (20-14-3, 9) and Koshinmaru Saito (19-5-1, 10) who will be risking his OPBF and Japanese rankings against Yuichi Ideta (13-9-1, 7). These bouts may not set the pulses going but both have real significance to the men involved who will likely fall away from any possible title fight if they were to lose. In total there are 8 contests on "Dangan 94" though we feel we've covered the 3 most significant. The other show in Japan is "Real Spirits 35" which features a total of 7 bouts though very few bare any real significance or any sort of a "competitiveness" to them. The one bout that is competitive, at least on paper, is the show's main event which will see Kota Fukuoka (15-3-2, 12) fighting against Akihiko Katagiri (13-7-2, 4). Fukuoka is the the #10 ranked Featherweight according to the OPBF whilst Katagiri is the #12 ranked Featherweight by the JBC meaning that we have a pretty good looking contest here. As with the other show, it's not just the fighters in the main event who are ranked and the show will also feature Ryotaro Kawabata (9-2, 3) the #12 ranked Super Flyweight according to the OPBF, Tokiya Nishioka (7-3-2, 3) who holds rankings with both the JBC and OPBF and Kazuki Hashimoto (8-4, 4) who is ranked by the JBC. Unfortunately it appears these three men are in "gimmes" and really shouldn't have any risk of losing their rankings. A third Asian country getting involved in the action on Friday is the United Arab Emirates. Although details on this show are scarce we're lead to believe that the main event will see Joseph Chingangu (27-9, 20) fighting against Francis Zulu (17-3-2, 8). Rather oddly the vacant IBF Continental Africa Heavyweight title will be apparently be on the line. Although both fighters are from Zambia we don't understand why they'd be going to Dubai to contest a regional title belt. Outside of Asia we get another Asian fighter in action. This time it's the Filipino born Bruno Escalante (11-1-1 5) who will be attempting to claim the International Boxing Association Super Flyweight title. In Escalante's way will be the very experienced Lorenzo Trejo (33-28-1, 20). Although Trejo has a huge edge in experience it's difficult to imagine him beating Escalante, in fact it's difficult to even see him testing Escalante after suffering numerous stoppage losses in recent contests.